Traveling overseas? Make an investment in protecting your health! 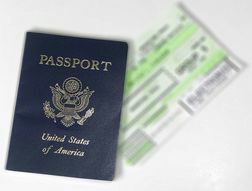 The Monongalia County Health Department now offers travel exams, and immunizations for international travel and immigration. Dr. Lee Smith, Monongalia County Health Officer, provides physical exams with pre-travel counseling and education. Prescriptions, for malaria and traveler’s diarrhea for example, are also available with the travel exam. Refer to the CDC Travelers' Health page for the most up-to-date information on recommended vaccines for travelers. MCHD offers a variety of travel vaccines at cost, plus an administration fee. There is no prescription required. Separate immunization appointments are also available. When traveling abroad, planning is very important. Appointments with the travel clinic should be made well in advance, at least 4-6 weeks prior to your departure. Bring a copy of your immunization record, and the International Certificate of Vaccination, if you have one. Be prepared to tell us about your itinerary: what countries you plan to visit, when, what activities you have planned, and for how long; and your accommodations. The CDC can help you determine which vaccines you need before travel. Using The CDC's Traveler's Health site provides travelers with the knoweledge of which vaccines are needed for their destination as well as up to date traveler health concerns. For step by step directions watch our video "Knowing Which Vaccines To Get Before International Travel"